Brett Carr, David Fitzharris and Bill McDonald with Kane and his sister Naveen. THE Build For A Cure house in Medowie’s Bower Estate, has risen from the slab at a cracking pace, and is almost ready for the big reveal. The Build for a Cure projects works with the Children’s Cancer Institute research with their aim to cure childhood cancer. This very special “House Built with Love” will be auctioned on the 21st of October, with all proceeds from the sale going directly to fund Children’s Cancer Institute’s vital research. 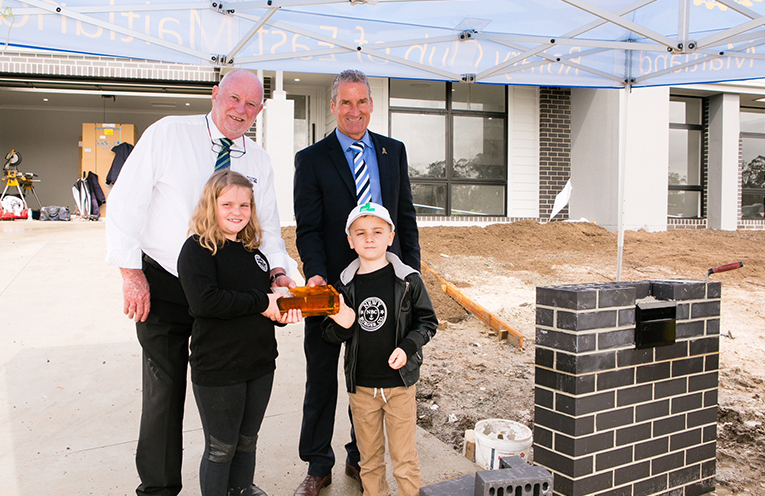 This week saw a special ceremony take place, with the laying of a commemorative ‘gold’ brick into the mailbox of the house. 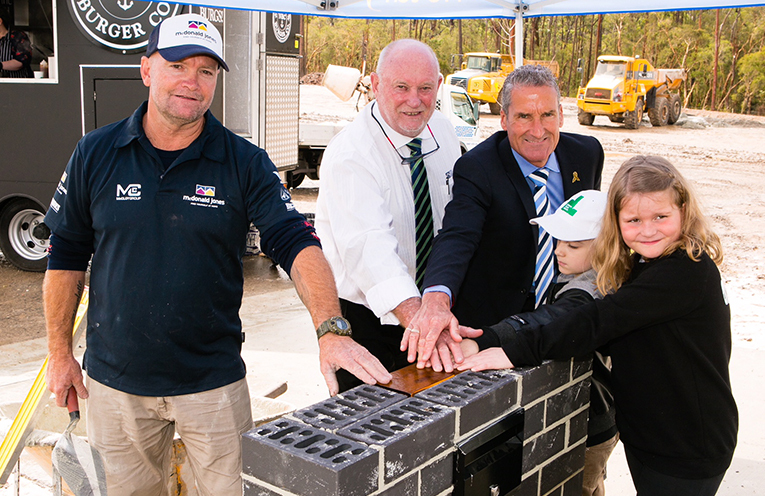 Local builder Brett Carr, who has worked on the build of the house, officially laid the brick. Brett has been personally touched by cancer, having lost his young daughter Charlie to childhood cancer last year. The Ransom family also joined the special ceremony, with their son Kane, who is currently battling Cancer. Kane’s Mother Natalie and her family attended Wirreanda Public School when they were young. Kane is 7 years old, and was diagnosed with Leukemia a few years ago. He won that particular fight, but has recently relapsed. “It doesn’t only strip the child of a normal childhood, it strips siblings and families of having dreams and goals, plus much much more,” she said. Kane and Naveen Ransom with Group GM Sales and Export at Brickworks David Fitzharris and CEO of McDonald Jones Homes Bill McDonald.